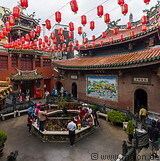 The Matsu temple (天后宮, Tiānhòu Gōng in Chinese, aka Mazu) was was built on land donated by Shih Shi-Bang in 1725 and was renovated three times in 1815, 1874 and 1963. The temple is richly decorated and attracts a large number of visitors. It is surrounded by a pedestrian area with many vendors and stores selling a variety of traditional snacks, sweets and drinks.